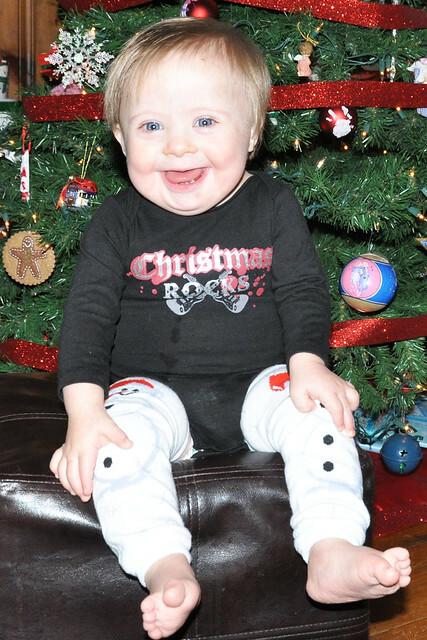 It's hard to believe that Christmas was almost a month ago! I'm convinced 2015 is already going by quicker than 2014! 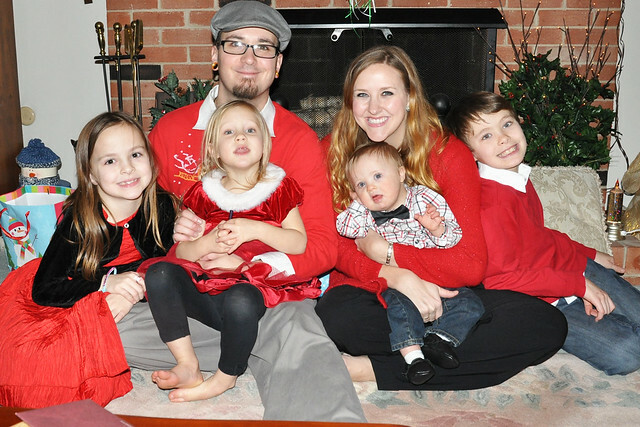 Thanks to my lack of free time, I'm just now getting around to posting about our amazing Christmas. 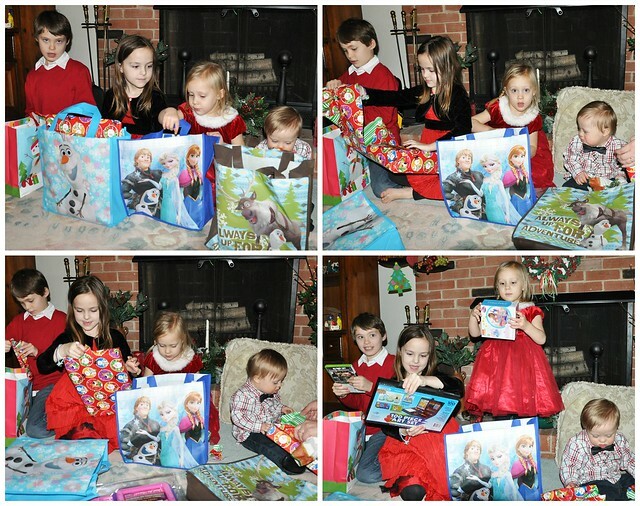 We had the best Christmas this year! It just felt like life couldn't possibly get any better! 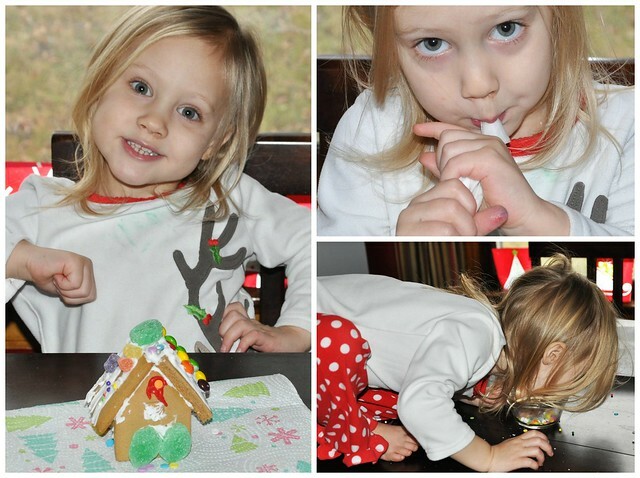 We kicked off Christmas Eve by making our gingerbread houses. 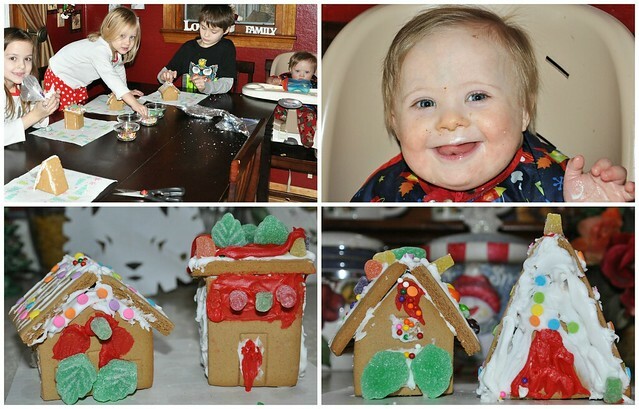 My mom bought my kids a kit that contained 4 mini houses, so it was perfect for my family! 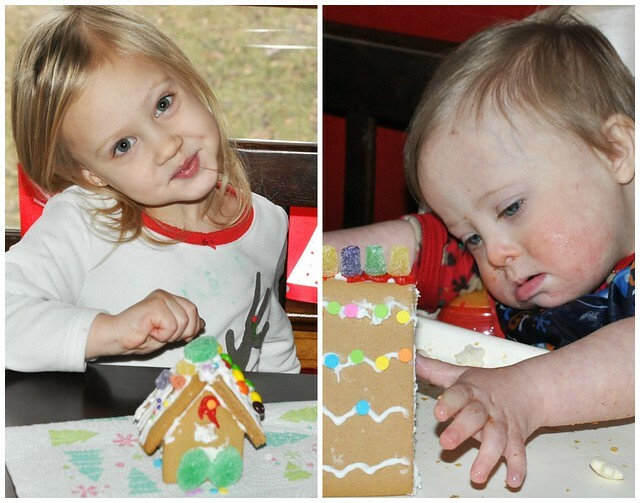 I don't think we made gingerbread houses last year, because it ended up being a lot more work for me. 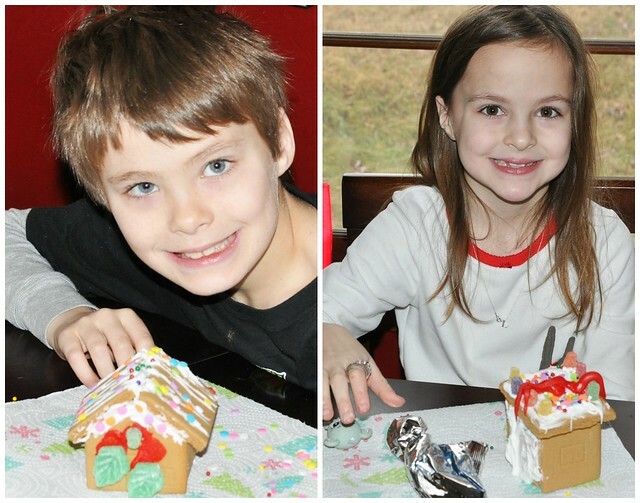 This year, Dylan, Lexie, and Lily completed their houses with minimal help from me! Liam, of course, preferred to eat and watch what everyone else was doing! 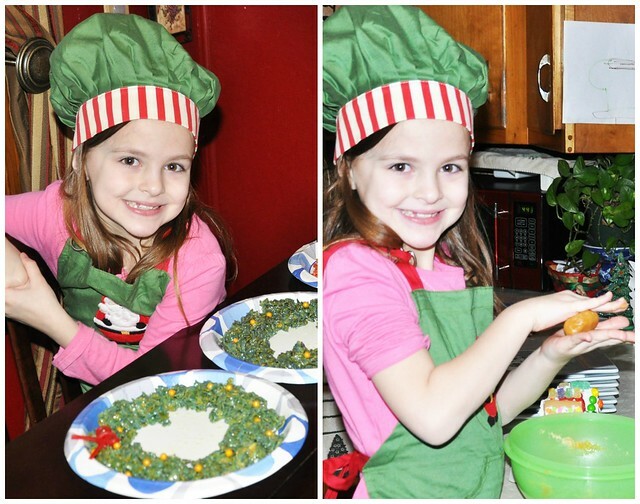 After we cleaned up the gingerbread houses, the girls made some reindeer food to use that evening. 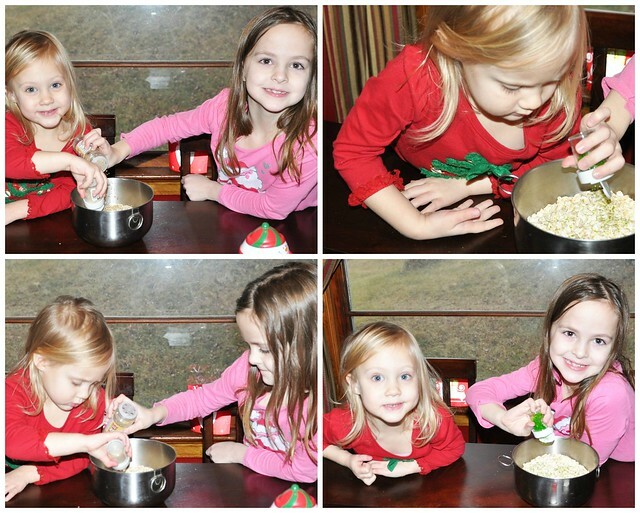 We use a simple recipes: oats and edible glitter! The boys wanted nothing to do with that process! By that point, it was afternoon, and Lily and Liam fell asleep. Dylan wanted to play, but Lexie decided to help me in the kitchen. 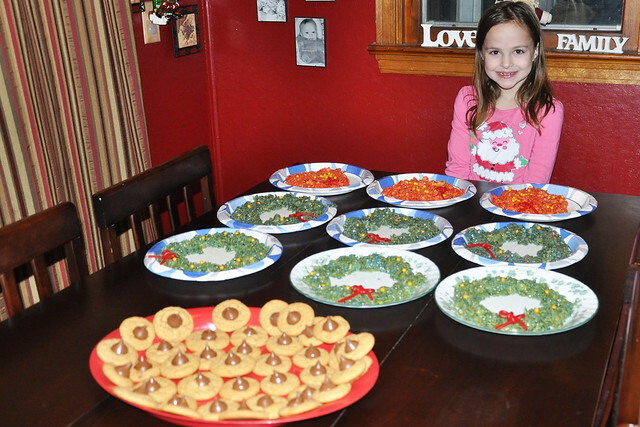 We had cornflake wreaths to make and cookies to bake. Lexie impressed me so much, and ended up doing most of it herself! 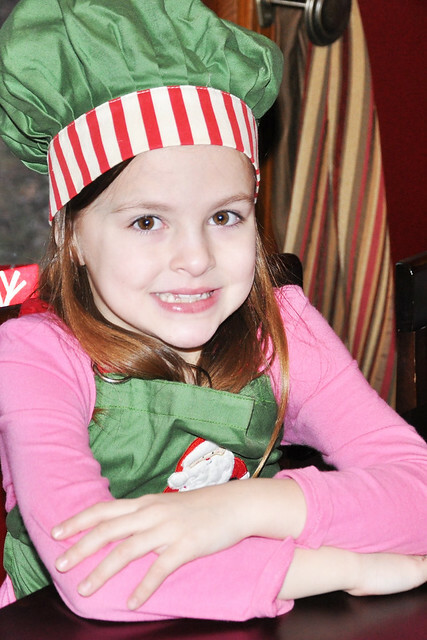 I'm so glad I have a new baking partner! 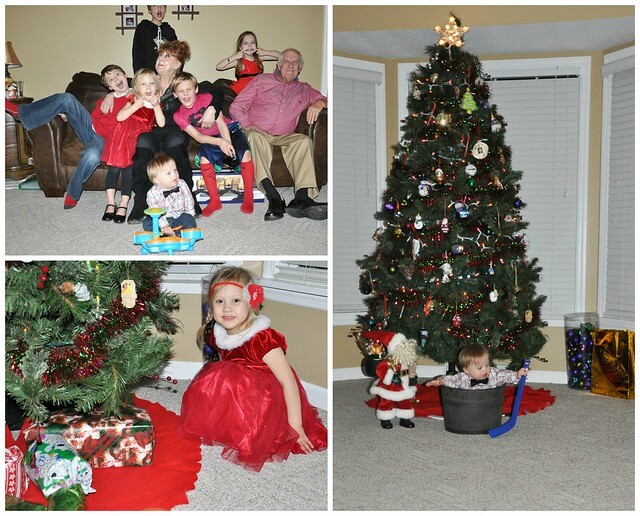 We had a fun, productive Christmas Eve morning and afternoon at home. The only thing that would have made it better was if Grant was home, but unfortunately, he had to work. Hopefully he can stay home next year! As soon as he got home we all got changed and went to my sister, Andrea's, house for Christmas Eve dinner and presents. 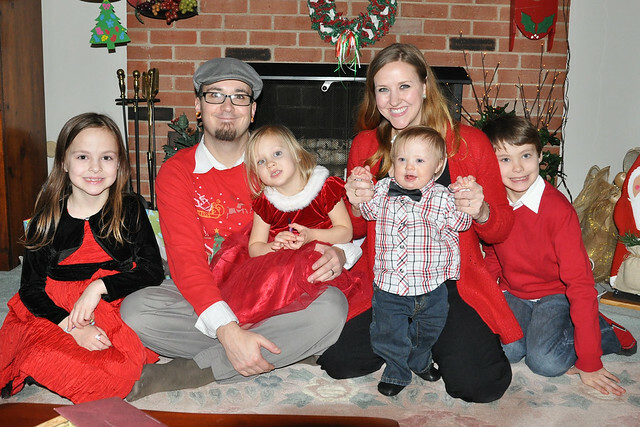 It was the smallest Christmas Eve celebration our family has ever had. 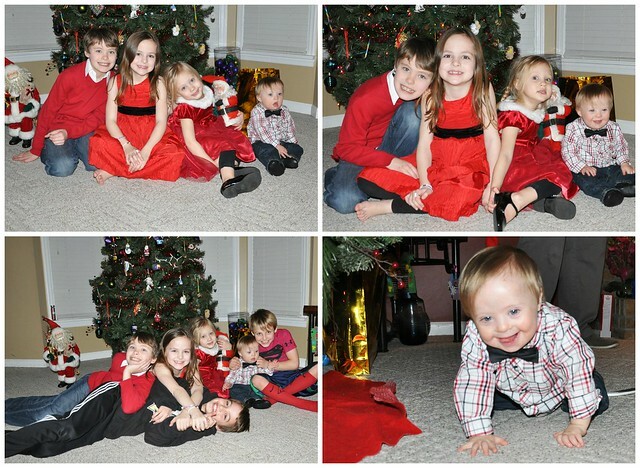 Unfortunately, our other siblings had other plans, but we still managed to have a great time! My parents were there and Andrea's in-laws were there. 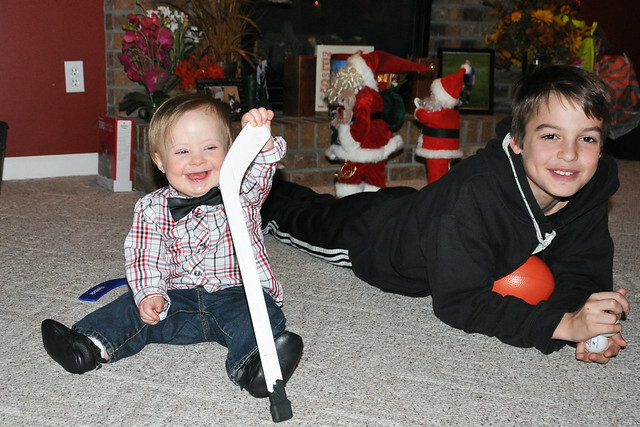 It really is a fun group of people, and my kids had a lot of fun playing with my nephews, Brady and Brandon! 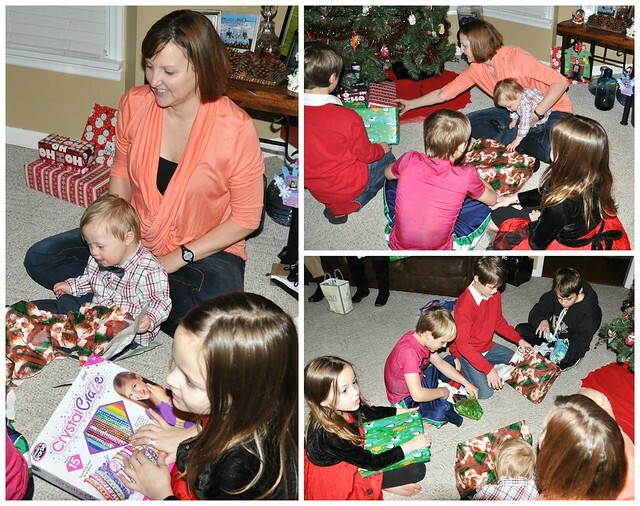 If you ask the kids, they will tell you their favorite part of our Christmas Eve get together is the gift exchange! We always do it after we eat, then send the kids on their way to play! 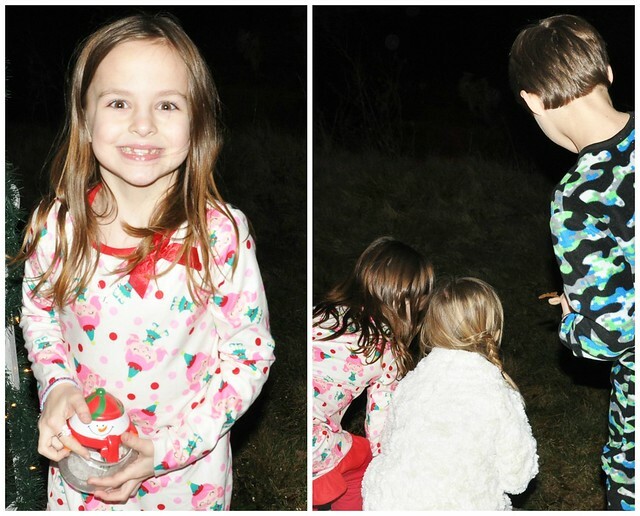 The big hit of the night was Lily's Frozen boombox from Annie and her family! She opened it, and immediately got quiet. Grant took it out of the box, handed it to her, and she took off to another room. Within a few seconds we heard her belting out a song, in the dark! Liam was so happy all night! 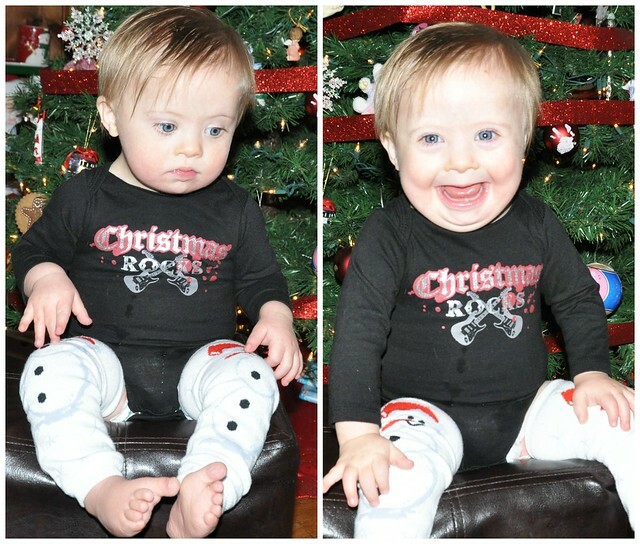 He had a smile on his face at all times! The evening flew by, just as it always does. I always end up reminiscing about when my parents, siblings, and I spent all of Christmas Eve together. Time flies. 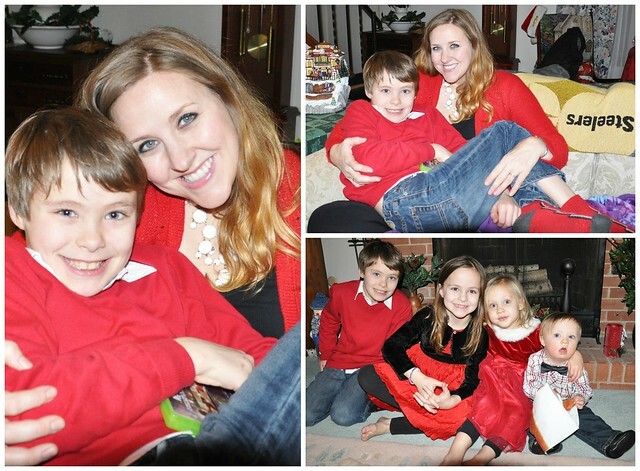 Even though I miss the old days, I'm also thrilled that I still get to spend Christmas Eve with them, now with my family included! By the time we left my sister's house, it was pouring down rain. We drove to see a house that was featured in the paper (we weren't too impressed), and discovered a fantastic new neighborhood on the drive back. It was so nice to look at all the Christmas lights with my family! Our final stop of the evening was at Grant's Nannie's house. 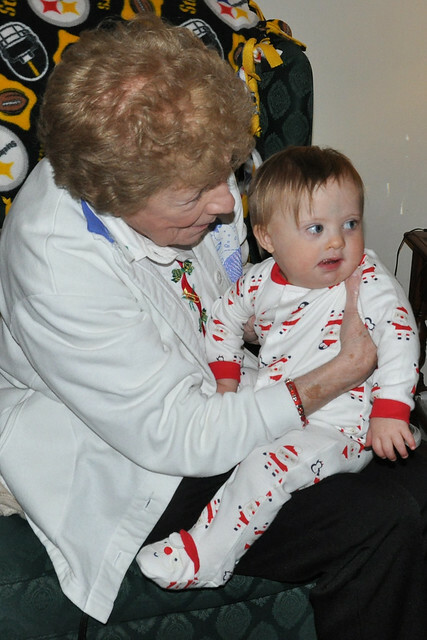 We end Christmas Eve at her house every year! 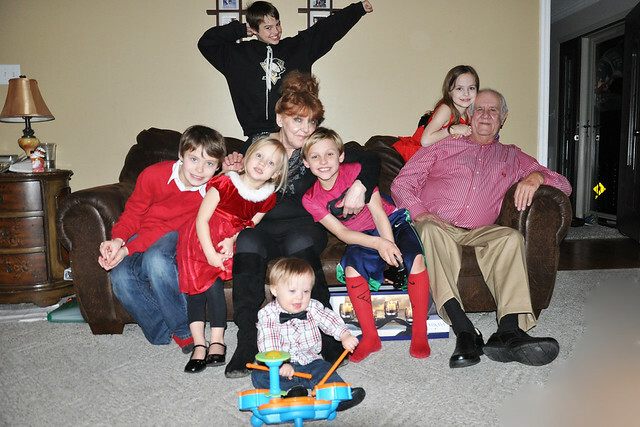 We love spending time with Nannie, Grant's mom, and Grant's Uncle Scott! We eat (I have to admit, I'm a huge fan of Uncle Scott's homemade eggnog. 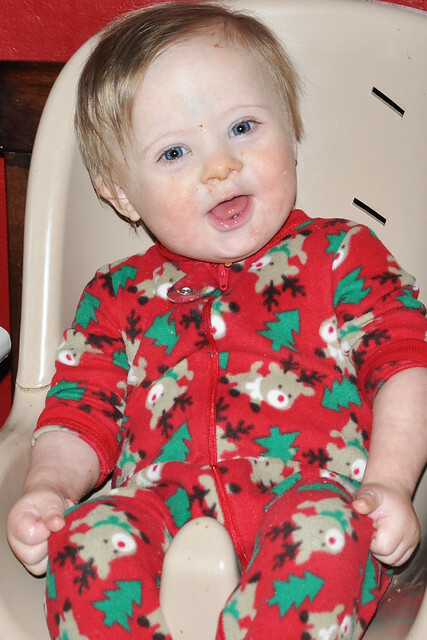 It's my favorite part of the Christmas Eve food spread! 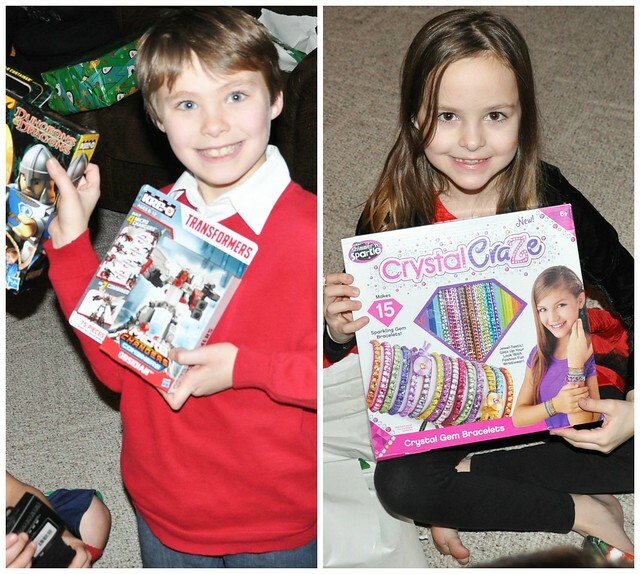 ), exchange gifts, and have some awesome traditions with the kids! 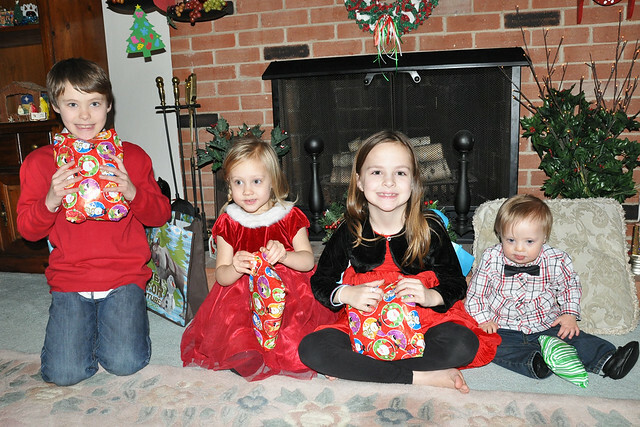 After we ate, Grant and I gave the kids their Christmas Eve bags. 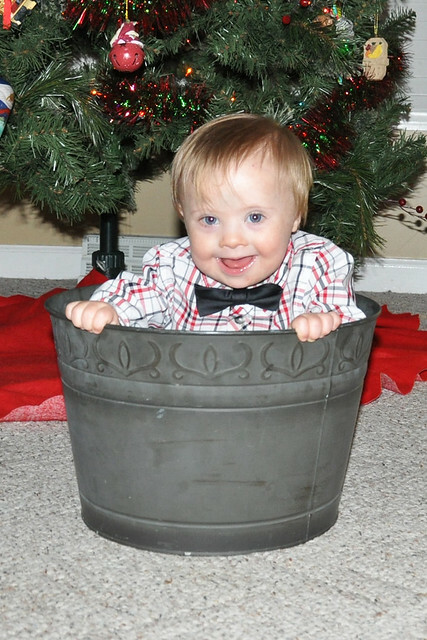 The only gifts the kids get from us is on Christmas Eve. Everything else is from Santa and relatives on Christmas Day. 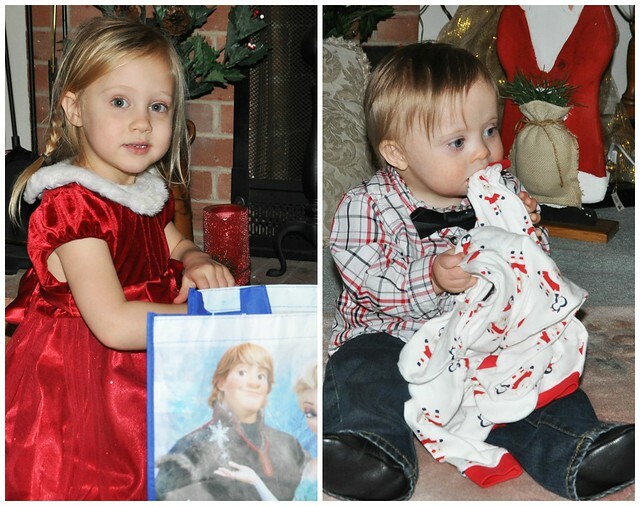 I love how Liam's tiny gift bag is almost as big as he is! 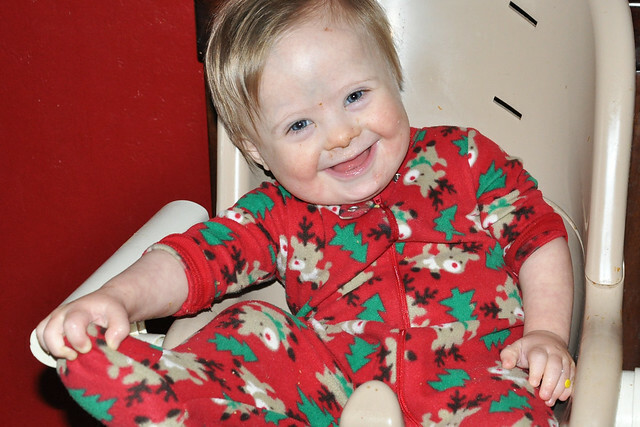 Dylan's favorite gifts were his new xbox game and T-shirt, Lexie loved all her art supplies, and Lily loved her Disney Princess Klip Klop horses. 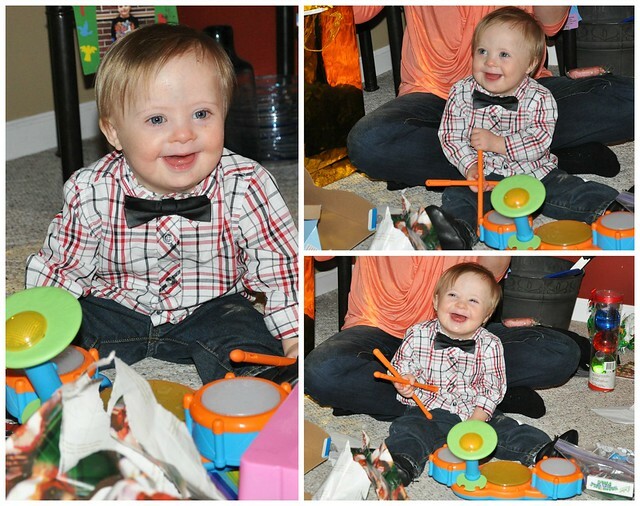 Liam just loved the wrapping paper! Just keeping it real! 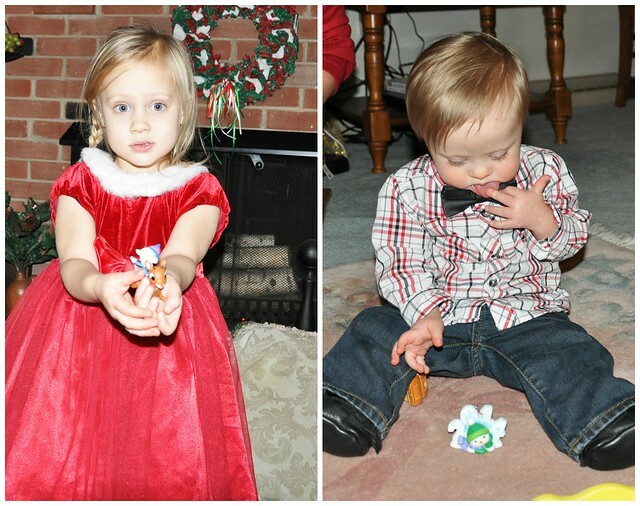 After they opened their gifts from us, Grant's mom gave them their new ornaments. 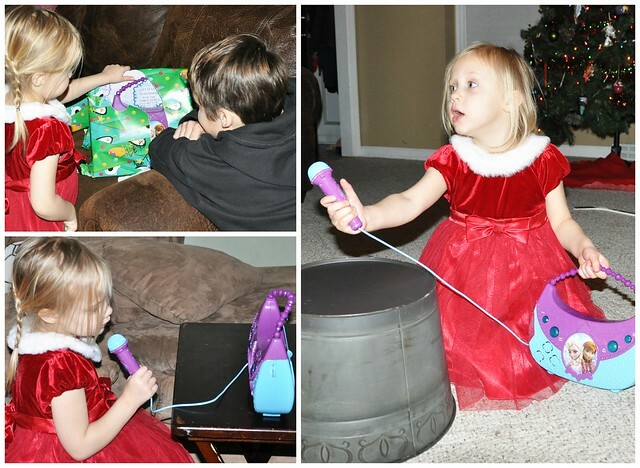 She does this for them every year and they really look forward to see what she chooses for them! 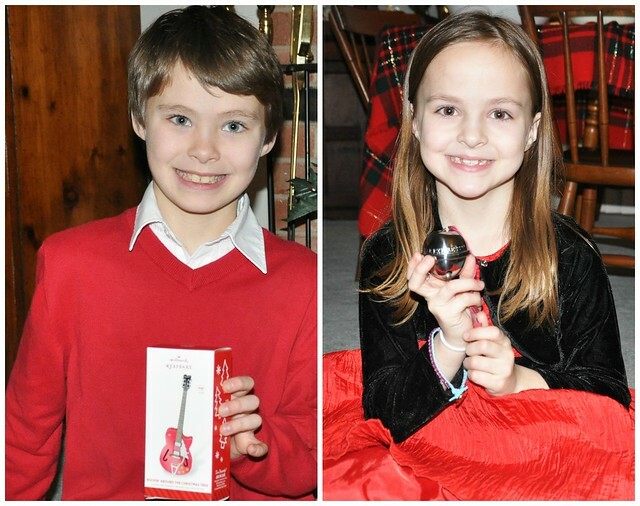 This year, Dylan got a guitar that plays music, Lexie got the Polar Express bell (she was obsessed with The Polar Express this Christmas), Lily got Rudolph with a light up nose, and Liam got a 2014 ornament. 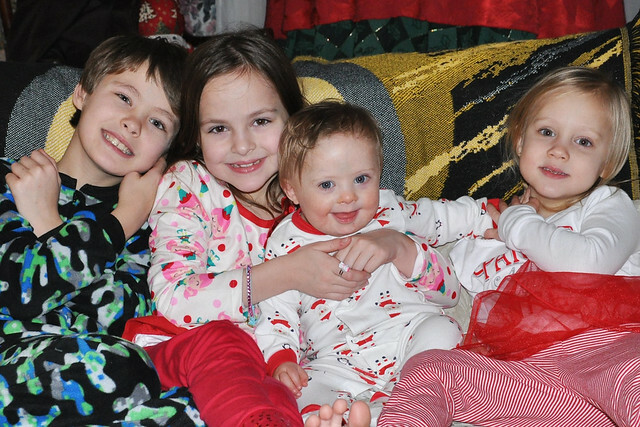 Finally, it was time for our final tradition: Christmas Eve pajamas. 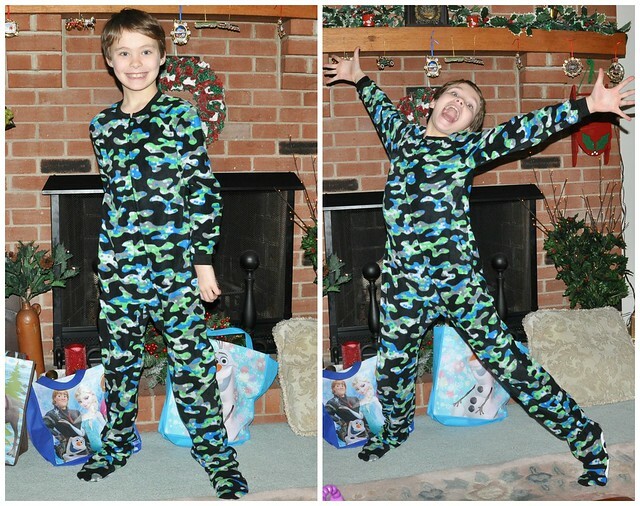 I think the older kids are just as excited about their new pajamas as they are about their presents! As soon as they open them, they run off to change! Before long, it was time to go home. 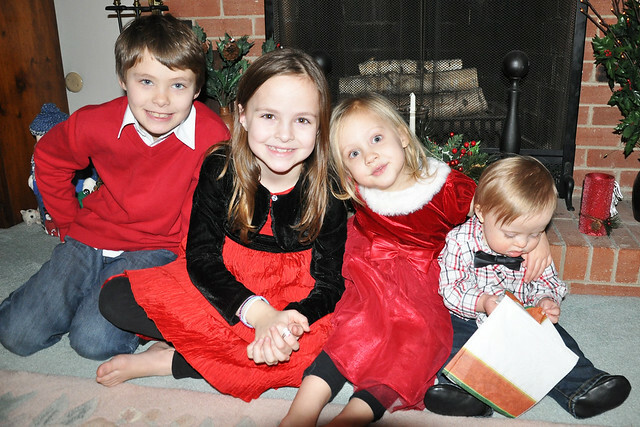 Midnight was rapidly approaching, the kids were getting tired, and Santa still had to visit our house. We said our goodbyes and headed home! 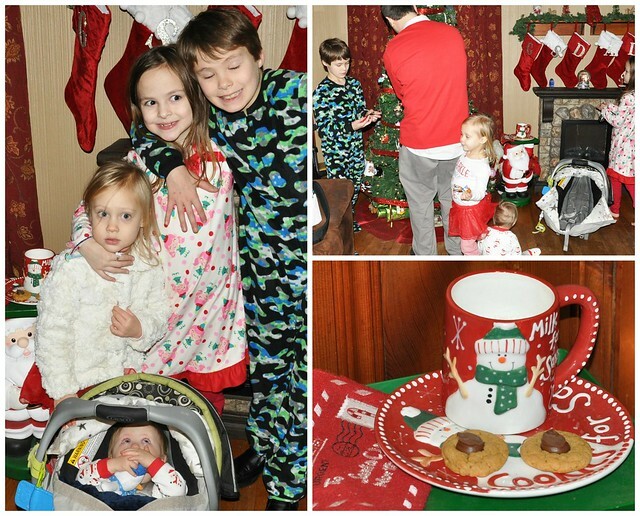 As soon as we got home, we rushed into our before bed Christmas Eve traditions. The kids sprinkled reindeer food in our yard, put out milk, cookies, and carrots, and hung their new ornaments on our tree. Grant and I tucked our sweet babies into bed, kissed them goodnight, and sat down to relax for a few minutes. 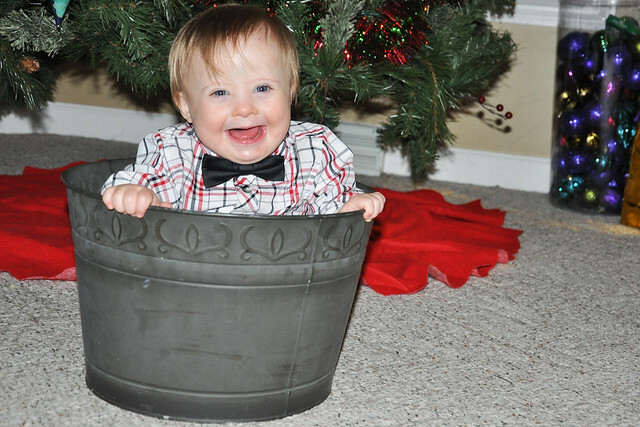 We both talked about how much we enjoyed Christmas Eve this year and how it felt like the best one yet! 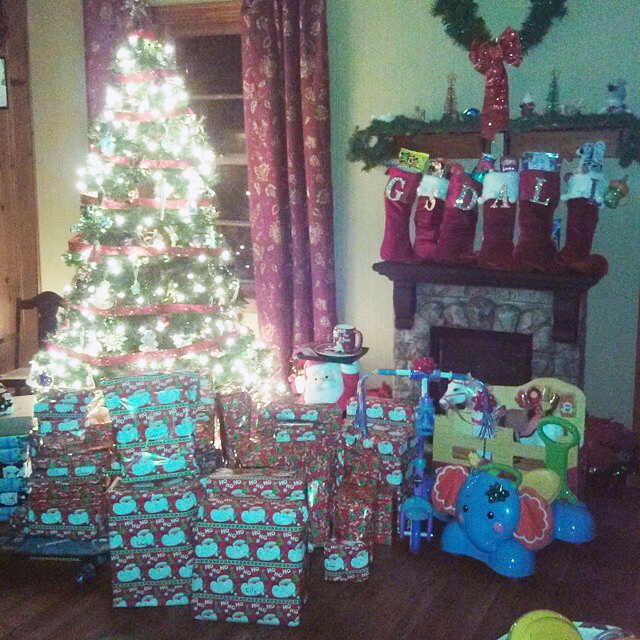 It was such a wonderful Christmas Eve...and shortly after the kids drifted off to sleep, Santa arrived! Sounds like a great Christmas was had. 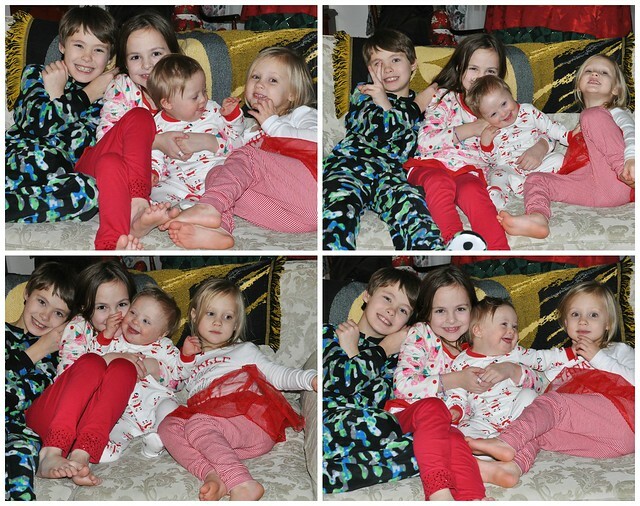 Love their Christmas PJ's too! 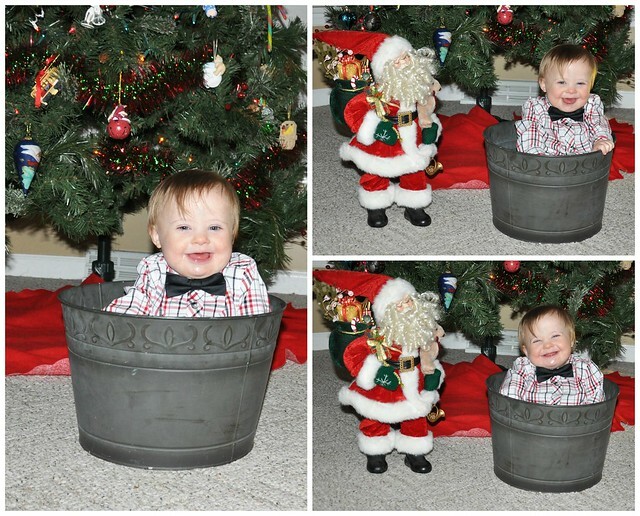 What beautiful Christmas memories you are making for your kids. 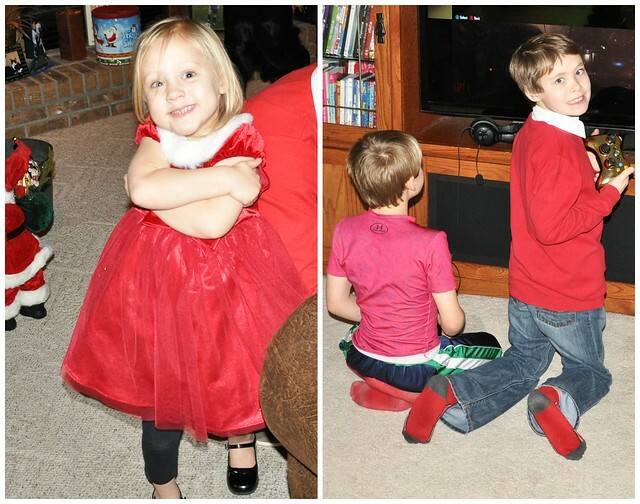 They will look back on these traditions with happy hearts. Sounds like such a great day & such awesome traditions!! !